The Ebac Powerpac Dehumidifier is one of two models in the Powerpac series. The other machine in the series is the Powerpac 18 Dehumidifier. This differs in having a water extraction rate of 18 litres per day, suitable for a home of up to four bedrooms, or a maximum floor area of 180 m2. In all other respects these two models are the same and all other comments and information apply equally to both. The main difference between this dehumidifier and others in the Ebac range is its small size. If we compare it with the Ebac 6100 Dehumidifier, for example, it is 30 mm narrower, 30 mm less deep and 155 mm shorter, in addition to being 2 kg lighter in weight. This small size has not been achieved by any sacrifice in performance. The Ebac Powerpac 21 Dehumidifier incorporates all the power and technology of the Ebac 6100 Dehumidifier and is suitable for the same floor area. It is equally energy efficient because of three technological innovations installed in both. SMART Control™ is a patented invention by Ebac which records the pattern of higher and lower humidity in your home and uses that information to predict the levels likely to occur the next day. By programming itself to switch on at times of high humidity and switch off when humidity is low this system improves energy efficiency. According to Ebac's figures this amounts to an energy saving of 30% in comparison with comparable dehumidifiers that are not equipped with this device. "Intelligent defrost" is the second of these energy saving features. All dehumidifiers which, like most built for the home, use refrigeration coils to condense water from the air, have a tendency to form ice on the coils when the temperature is lower than around 15°C. "Intelligent defrost" anticipates when this is about to happen and suspends the refrigeration process to allow defrosting to take place. Compared with other methods used for defrosting dehumidifiers Ebac say theirs is quicker and more energy efficient. Thirdly, this dehumidifier is equipped with "hydrophilic" coils. This means that the coils are specially coated to accelerate the rate at which water drips off them. This speeds up the extraction and collection of water and saves more energy. The Ebac Powerpac 21 dehumidifier is capable of a maximum water extraction rate of 21 litres per day. Please do not expect that rate to be achieved in the conditions normally found in your home. In the table below you will see that the figure of 21 litres was recorded at a temperature of 32°C and a relative humidity of 90%. Extraction rates fall dramatically in cooler, less humid conditions. All dehumidifier suppliers quote the figure this way. What it tells you is that one dehumidifier will extract more water in a given time than another. Quoting the rate under "standard" conditions, however unrealistic, makes it possible to compare two different dehumidifiers on a level playing field. For customers who purchase The Ebac Powerpac 21 Dehumidifier directly from Ebac a free five year warranty is included. Other retailers also supply this machine, often at lower prices, but the free warranties offered are generally for no more than two years. Additional years may be offered at an additional charge, depending upon the supplier. Ebac will only deal directly with warranty claims from customers who have purchased directly from the company. All other customers must pursue any warranty claim directly with the supplier from whom they purchased the dehumidifier. This also applies to any returns, refunds or replacements. When comparing prices, therefore, it is more realistic to add the cost of additional years of warranty cover to a third party retailer's ticket price to make a fair comparison between his price and Ebac's price. The unique advantage of this machine over any other Ebac dehumidifier, and many from other manufacturers, is the power it offers in a small package. 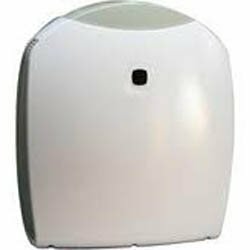 If you have an ideal spot for a dehumidifier with limited head-room. beneath a low shelf or table for example, this machine may fit where a taller appliance of similar performance may not. The Ebac Powerpac 21 may also sit comfortably on a shelf or other raised surface and not look out of place. Versatility - The low minimum temperature at which the appliance can operate makes it suitable for colder spaces, garages or basements for example, in addition to the living areas of your home. An adjustable humidistat - This device switches the machine off when the pre-set level of humidity is reached, saving energy and preventing humidity levels falling below comfortable levels. The cost of this machine is higher than some. This reflects its build-quality and the energy saving gadgets it contains. Only you can decide whether these advantages are worth paying for. The published noise level of this machine is a little higher than some comparable dehumidifiers and this may be a factor for you in making your choice, particularly if it will be used in a bedroom. This is a recently introduced product and no consumer reviews are currently available. We shall be pleased to publish your experiences and reactions to the Ebac Powerpac 21 if you care to share them with us and our visitors.